The Physics C Exam is actually composed of two separate exams: one in Mechanics and one in Electricity and Magnetism (E & M). You can take just the Mechanics, just the E & M, or both. Separate scores are reported for the Mechanics and the E & M sections. Whether you take just Mechanics, just E & M, or both, your exam will contain two sections: a multiple-choice section and a free-response section. Questions in the multiple-choice section are each followed by five possible responses (only one of which is correct), and your job, of course, is to choose the right answer. Each right answer is worth one point, and there is no penalty for a wrong answer. There are 70 total multiple-choice questions on the full Physics C Exam, and the time limit is 90 minutes. You may not use a calculator on the multiple-choice section. The free-response section consists of six multi-part questions, which require you to actually write out your solutions, showing your work. The total amount of time for this section is 90 minutes, so you have an average of 15 minutes per question. Unlike the multiple-choice section, which is scored by computer, the free-response section is graded by high school and college teachers. They have guidelines for awarding partial credit, so you don’t need to correctly answer every part to get points. You are allowed to use a calculator (programmable or graphing calculators are okay, but ones with a typewriter-style keyboard are not) on the free-response section, and a table of equations is provided for your use. The two sections—multiple choice and free response—are weighted equally, so each is worth 50 percent of your grade. 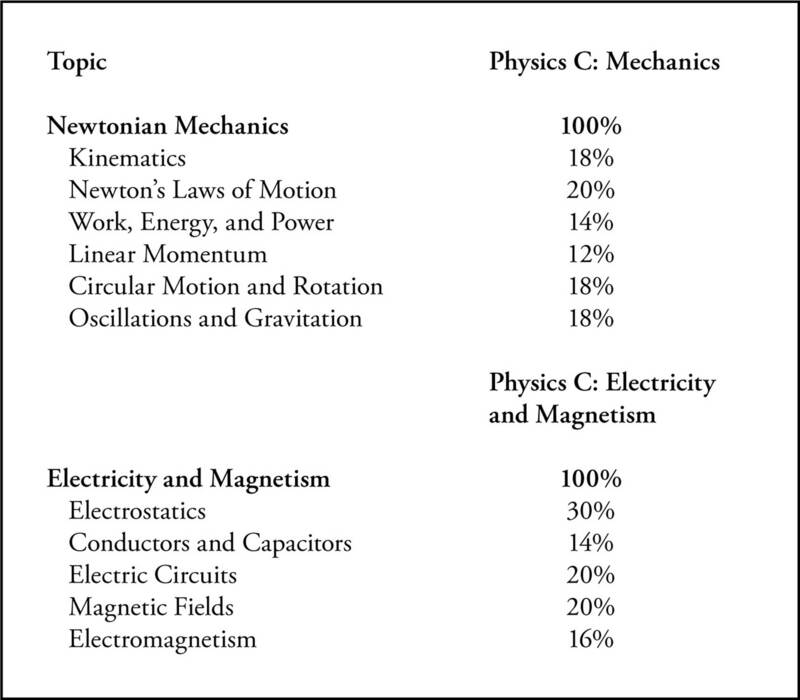 The percentages needed are usually a little lower for the E & M section of Physics C.
Naturally, it’s important to be familiar with the topics—to understand the basics of the theory, to know the definitions of the fundamental quantities, and to recognize and be able to use the equations. Then, you must practice applying what you’ve learned to answering questions like you’ll see on the exam. This book is designed to review all of the content areas covered on the exam, illustrated by hundreds of examples. Also, each chapter (except the first) is followed by practice multiple choice and free response questions, and perhaps even more important, answers and explanations are provided for every example and question in this book. You’ll learn as much—if not more—from actively reading the solutions as you will from reading the text and examples. Also, two full-length practice tests (with solutions) are provided at the end of this book. The difficulty level of the examples and questions is equal to or slightly above AP level, so if you have the time and motivation to attack these questions and learn from the solutions, you should feel confident that you can do your very best on the real thing. College Credit. Some colleges will give you college credit if you score well on an AP Exam. These credits count towards your graduation requirements, meaning that you can take fewer courses while in college. Given the cost of college, this could be quite a benefit, indeed. Satisfy Requirements. Some colleges will allow you to “place out” of certain requirements if you do well on an AP Exam, even if they do not give you actual college credits. For example, you might not need to take an introductory-level course, or perhaps you might not need to take a class in a certain discipline at all. Admissions Plus. Even if your AP Exam will not result in college credit or even allow you to place out of certain courses, most colleges will respect your decision to push yourself by taking an AP Course or even an AP Exam outside of a course. A high score on an AP Exam shows mastery of more difficult content than is taught in many high school courses, and colleges may take that into account during the admissions process. There are many resources available to help you improve your score on the AP Physics C Exam, not the least of which are your teachers. If you are taking an AP class, you may be able to get extra attention from your teacher, such as obtaining feedback on your essays. If you are not in an AP course, reach out to a teacher who teaches AP Physics C and ask if the teacher will review your essays or otherwise help you with content. How many days/weeks/months away is your exam? How much time per day/week/month will you devote to preparing for your exam? Based on the answers above, will you focus on strategy (Part III) or content (Part IV) or both? What are your overall goals in using this book?